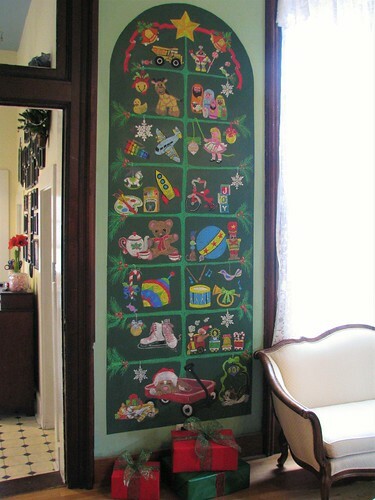 This is the fifth year my sister Genny and I made a chalkboard tree on the large chalkboard in the music room. 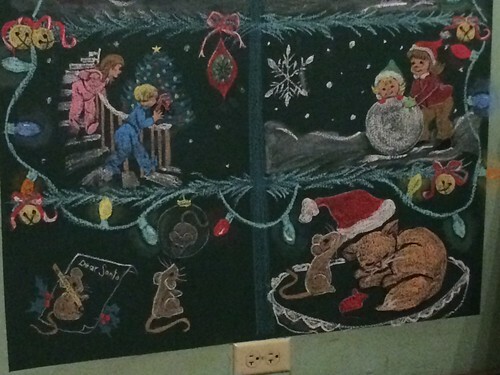 DH painted the chalkboard on the wall in 2011. 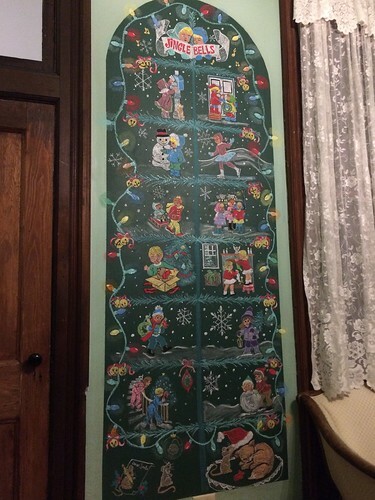 It is about eight feet tall. 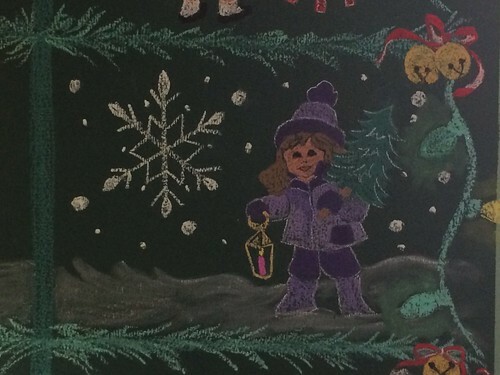 It took four coats of green chalkboard paint to cover well. 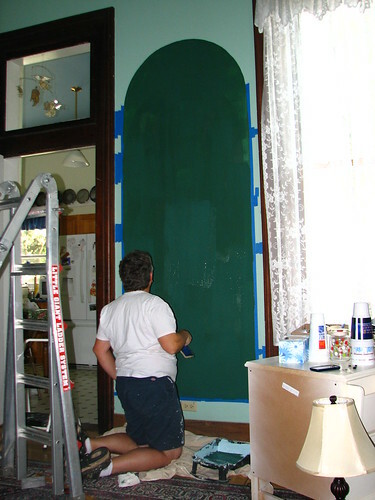 If you paint a chalkboard on a wall, be sure to sand the wall as smoothly as you can. All those tiny bumps add up when you are doing some serious chalk work later! 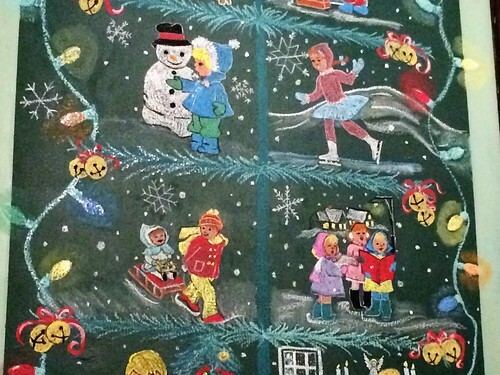 The 2012 tree was based on one I found online. 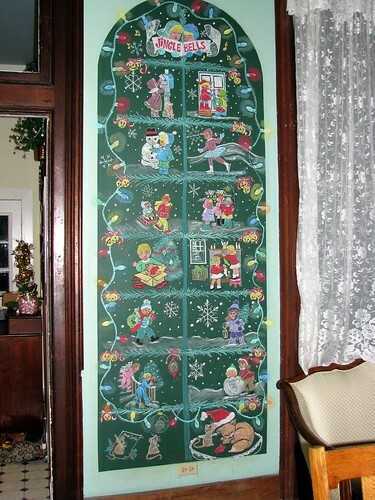 It, in turn, had been modeled after a wall hanging. 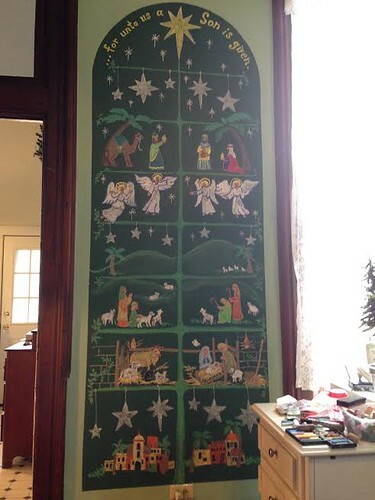 I added a nativity under my version. 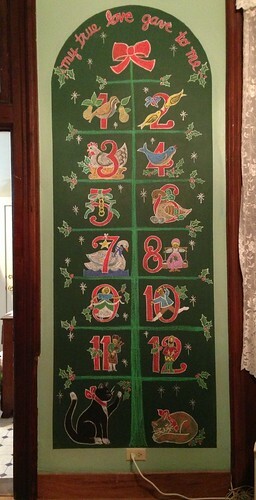 In 2013, we did a “Twelve Days of Christmas” theme. Under the tree were two of our cats, Zak and Cedar. 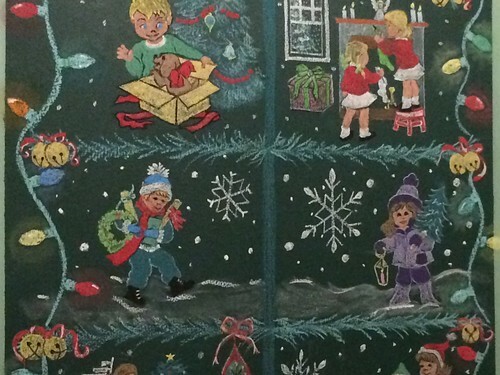 In 2014, it was a nativity scene. 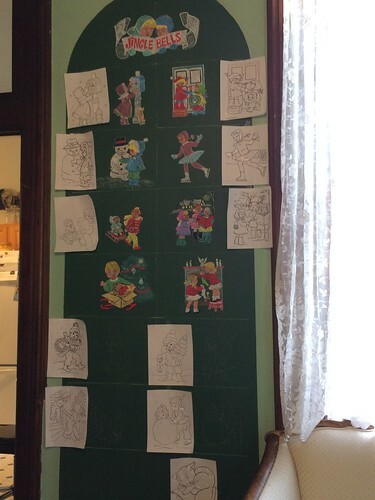 Last year we had a toy theme. 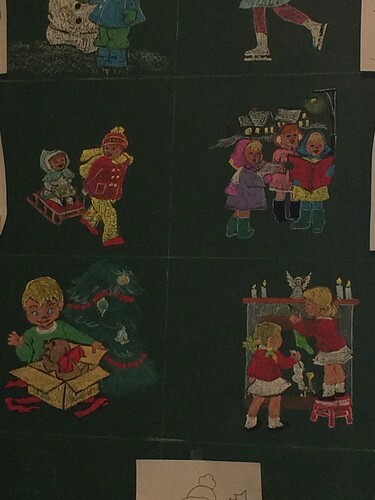 This year, it was a vintage style theme of children at Christmas. The process starts with deciding on a theme, then finding pictures to use. 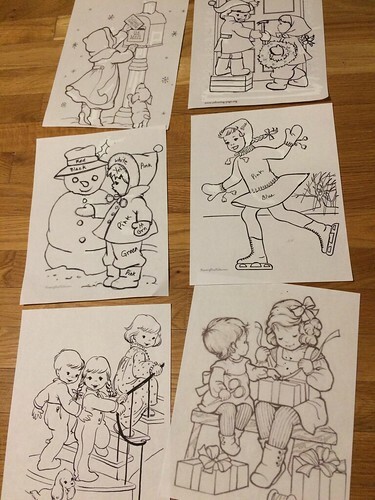 I googled < coloring pages vintage christmas children > and found a lot of pictures to choose from. I printed the ones I liked and then edited them. 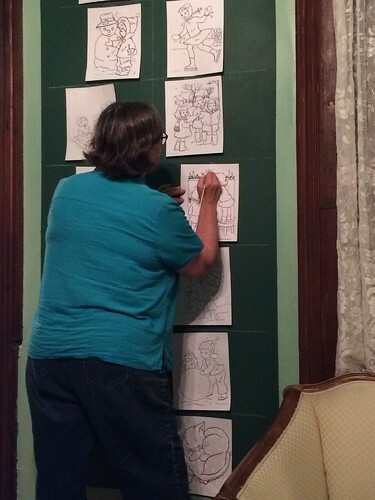 I took out details that would be hard to chalk or that weren’t needed to tell the story of the picture. 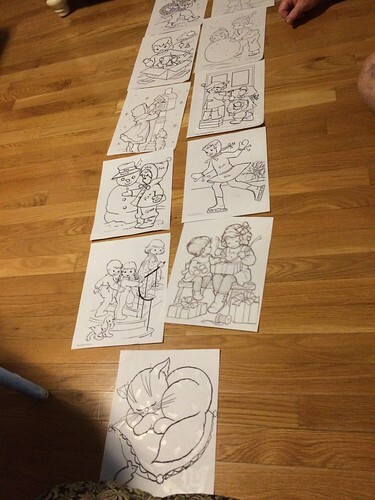 The next step is to lay them out and decide what order they should be in. I try to print four or five more than I need so there is some leeway when deciding how the pictures will go. When the order is decided, I take photos so we can remember how we want them. Aren’t phones great these days!? There’s always room for change, though. 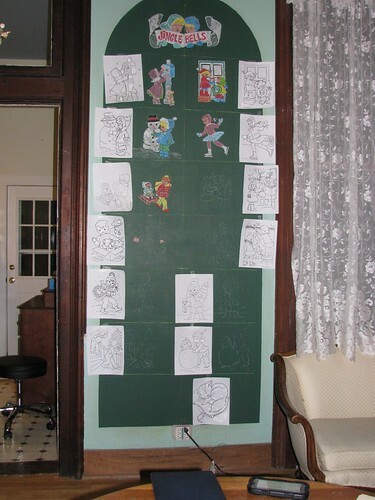 Once the pictures are taped on the chalkboard, we sometimes rearrange or substitute other pictures to make the design look more balanced. 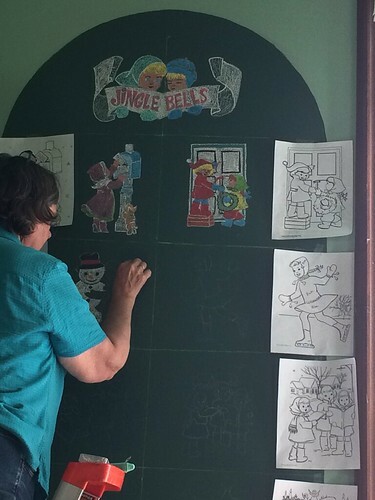 After we have the pictures in the order we want them, Genny starts the big job of tracing them onto the chalkboard. 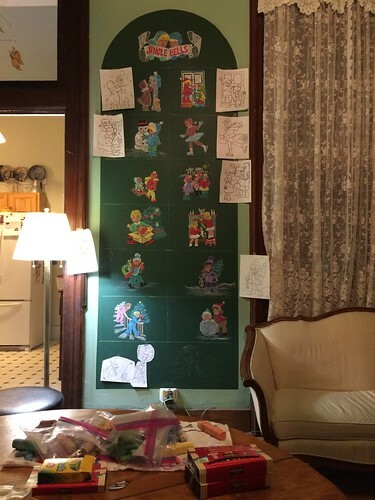 This year she used white graphite paper, placing a sheet behind the picture with the graphite toward the wall. She likes to use a bamboo skewer for the tracing. 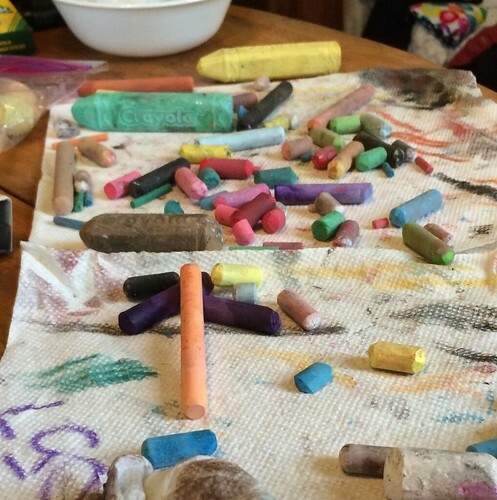 Genny leaves the pictures taped to the sides of the chalkboard for reference as she chalks. Starting at the top decreases the risk of smudging. 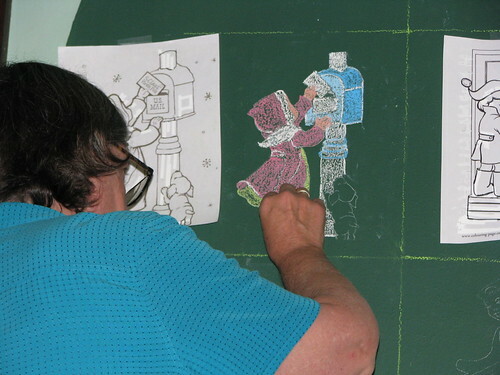 Genny uses a combination of sidewalk chalk and thinner art chalks to color the tree. 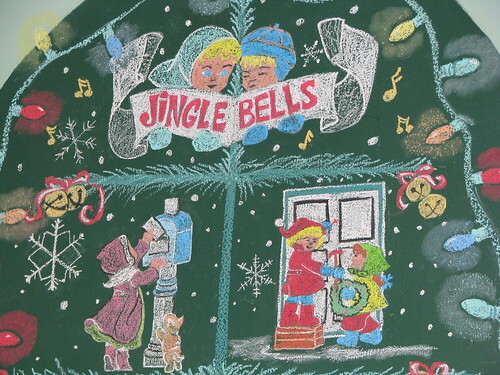 We also have some glitter sidewalk chalk that we use when appropriate. 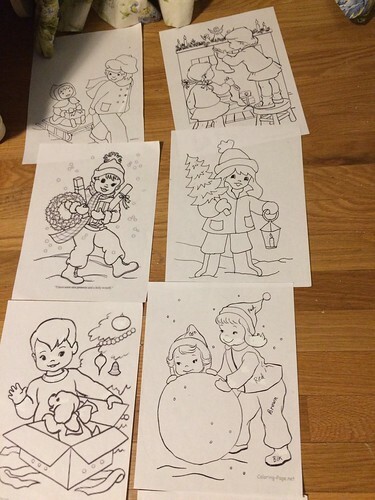 The lines between the pictures are drawn on before anything else. 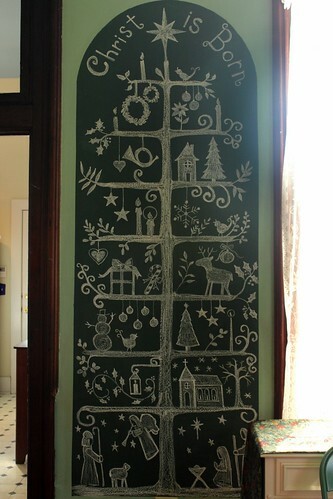 One vertical line to divide the chalkboard and then seven horizontal lines to make the branches. 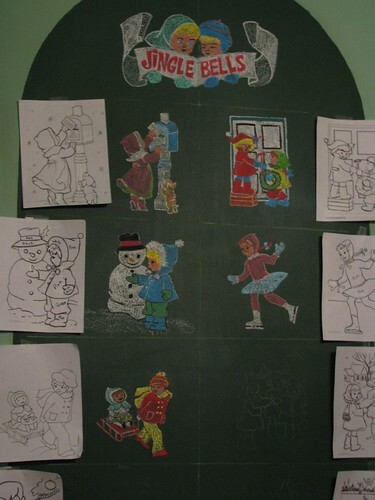 When the pictures were done, we added the branches, lights, jingle bells and the snow. This one reminded me of Genny. I really like the lights on this tree. We will probably use that idea again. This entry was written by ~~Rhonda, posted on December 11, 2016 at 12:11 am, filed under Christmas, trees. Bookmark the permalink. Follow any comments here with the RSS feed for this post. Post a comment or leave a trackback: Trackback URL. OH MY GOSH, I WANT ONE OF THESE…. You could make these and sell them…You’d make a mint…Everyone would enjoy having one of them in their home….I would love that in my morning room wall…I wonder if you can buy them anywhere, do you know?? ?